I kept the 386 until 1999 when we bought a new computer custom made from a company called Nutrend (now ABS). It had a BCM QS440BX motherboard with a Slot 1 Pentium III 450mhz processor, 128megs of PC-100 DIMM Ram, an 8GB hard drive, 40x CD Rom, an ATI Rage IIC graphics card, a Yamaha DX series sound card, and a Lucent Technologies 56K modem all housed in a Superpower Zephyr KS201XP Case. It ran Windows 98SE and was also my first computer to connect to the internet. Before I got this computer; my internet access was either courtesy of my neighbors or through computers at my local library. I know 56k dialup modems sound slow today but they were becoming mainstream back then; only ISDN and T-1 connections were the high speed alternatives but were mainly used by businesses or schools. When I got this computer; Clinton was near the end of his second term, the Y2K bug was all the big hype, I was just entering Jr. High, My Space was an online file storage site, and Diamond Multimedia had recently released the world's first MP3 player the year before; the Diamond RIO 300. 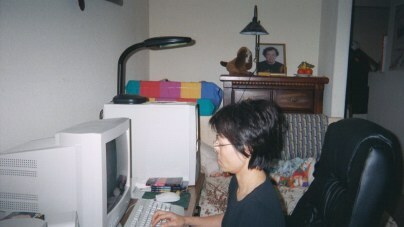 Fast foward to 2003 and as with all computers; my 450mhz P3 eventualy became obsolete within those four years but I still held onto my original system and little had changed. Around summer of 2003, my 17" Secptre Dragoneye CRT monitor blew up (something shorted out inside). It was replaced by a NEC 1760V LCD monitor. From there on, I slowly began upgrading my PC. My first major addition to my hardware was a LiteOn LTW 851S DVD burner. Most of my firends only had plain CD-R/RW burners at that time but the price of DVD drives were becoming cheaper by then. I bought mine for about 120$ but about a year earlier; they would have costed over 300$. My next few upgrades for that year included upgrading to Windows 98SE to Windows XP, adding a Netgear ethernet card, replacing the stock case fans with Panasonic Panaflos, changing to a 400watt power supply from the stock 250watt, upgrading the ram to 384mb from the original 128, and then replacing the original video card with a Radeon 9200. Installing Windows XP took up almost my entire 8GB hard drive so when I had saved up enough again; I bough a Hitachi 7K250 160GB hard drive around Christmas of 2004. It still only has 8GB on it currently (I don't download or rip CD's a lot .) I originally planned to buy a Seagate or a Maxtor brand hard drive but my mom said Hitachi was a very good brand so I got it instead. It was also on sale at Fry's for around $140. After getting the Hitachi drive; I read about it and found out it was rated very good by Maximum PC and PC Plus magazine. I was also surprised to learn that Alienware and VoodooPC gameing systems also use Hitachi drives in their products. Other than a few BIOS updates; I still had my original QS440BX board with the same Pentium III humming away. I found out about a company called Upgradeware. 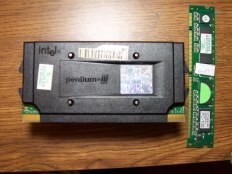 They made an adaptor card called the SLOT-T which allowed me to use a socket 370 processor (Either a Celeron Tualatin or a Pentium III Coppermine) in my old Slot-1 board. With that, I also got a Celeron 1.3ghz processer. It worked in my old QS440BX board without a hitch. Any of you with older computers that you still plan to keep or upgrade should try this or any other Upgradeware products. The Celeron rig was very short lived though; an overclocking attempt I did a month after I got it in Feburary of 2005 lead to a disaster when the heatsink fan accidently got disconnected and I fried my motherboard, adaptor card, and processor. Because of the "meltdown," here is my current rig.